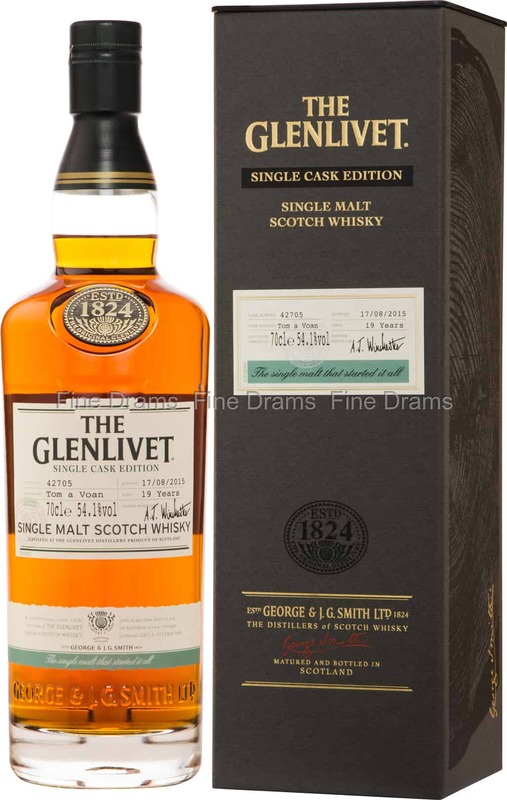 A rare, official single cask bottling from the mighty Glenlivet distillery, one of the indubitable giants of Speyside. This 19 year old whisky bears the name “Tom a Voan,” which it has taken from a small forest found in the Moray area, close to where George Smith established the distillery back in the early 19th century. In the early years of distilling, wood from these trees would have been used in the maturation of whisky. The whisky itself has been matured in cask number 42705 for 19 years. The dram offers up notes of leather, old oak, honeyed malt, raisins, classic Glenlivet flavours of apples and pears, tobacco smoke, cigar box, maple syrup, orange rind, pressed flowers, chocolate, toasted nuts, green tea and fresh melon. Bottled at 54.1% ABV and without either chill filtration or colouration, all of the whisky’s beautiful flavours are retained by this careful production. Truly glorious, this is an astonishingly rich and complex whisky from Glenlivet. A real treat.